In this Chapter, we will be looking at the discussions that took place at the Methodist Annual Conferences of 1745 and 1746. These discussions are summarized in the 17th part of A Plain Account Of Christian Perfection, and address the subject of, and the inward condition of, a person's sanctification. "Question. When does inward sanctification begin? Answer. In the moment a man is justified. (Yet sin remains in him, yea, the seed of all sin, till he is sanctified throughout.) From that time a believer gradually dies to sin, and grows in grace. I don't believe that Wesley's answer fully addresses the fact that for sanctification to begin, the person must be willing to have herself or himself "set apart" (the meaning of sanctification) from the evil of this world. Furthermore, such a person must be willing to be "set apart" for a sacred or holy purpose, which means that he or she can no longer be passive by avoiding evil, but he or she must be willing to take a stand against such evil. Let's look at an example of this passive and active condition of a "believer". We can be extremely thirsty and absolutely and fervently believe that a glass of water can quench our thirst (which is the truth). We may even tell others. However, if we don't take the step of faith to actually drink the water, we will remain thirsty; and if we persist, we could actually die in our thirst. Our knowledge and belief "justified" us to understand that our thirst was caused by a lack of water, and that the water could quench our thirst. This is not a one time occurrence, but a lifelong condition. Our "thirst" is an example of the awareness of the evil around us and the sin in our lives, and our dissatisfaction with it. The water is an example of the cleansing power of the Holy Spirit. For sanctification to truly and fully take place in our lives, we must feel a "thirst" for holiness and righteousness, and a desire to eliminate the "dryness" of the evil of this world and the sin in our lives. We also must desire to fully partake of the cleansing and refreshing "water" of the Holy Spirit. Let's look at the second question of the conference. By giving this answer in this particular way, Wesley seems to be countering the old and false belief that a person was "safer" to be saved just before death, so that they could not "lose" their salvation. This was a way of living in our sins until just before our death, and then confessing them and expecting God to forgive us, even though we knowingly and willfully sinned against the Lord, and knowingly rejected the unction of the Holy Spirit up until that time. If we are truly saved, then we should also desire to do the will of the Lord our God, immediately. In other words, we expect to be "justified" at the moment of our confession of faith; and we also should expect the "sanctification" process to begin immediately with the infilling of the Holy Spirit, to whom we also desire to listen. A person who is saved should desire to be "set apart" from the sins and corruption of this world, and to live as an example of God's heavenly will upon this earth. It is this inward struggle with our willingness to avoid evil and remove the sin from our lives, and to be conformed back into the image of God, that is the point being addressed in the next question. (3) he himself at the time of writing his former epistles, yet all this does not prove that we may not be so today. Just because someone else doesn't desire to achieve Christian perfection, does not mean that we shouldn't either. Evil always wants company and seeks to degrade another person's righteousness, as well as the God-given rights and wellbeing of all the animals. Thus, we are to separate ourselves from such influence, and then work to counter its desire from ourselves and others, which brings us to the next Conference question. "A. Scarce at all to those who are not pressing forward; to those who are, always by way of promise; always drawing, rather than driving." I believe this answer is telling us that it is almost unnecessary to preach sanctification to those who are truly seeking to become conformed back into the image of God, and to become perfect as He is perfect. 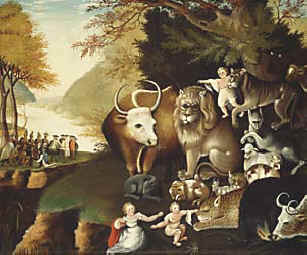 The preaching and teaching of sanctification is mostly for those who are the "takers" of this world, for those who want to go along with the ebb and flow of worldly ways of society, and for those who say they believe, but show little or no evidence in their lives of being conformed back into the image of God. Our third Conference began Tuesday, May 26, 1746. It all really boils down to a simple question. Do we truly desire to become perfect as our Father in heaven is perfect, or are we trying to find excuses why we are not? If we truly desire to become perfect as our heavenly Father is perfect, then God is actively sanctifying us. But if we are still trying to find excuses, then the sanctification process is not operating within us. 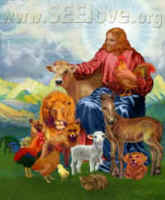 The sanctification process should make all who have it work to bring about the Peaceable Kingdom in the here and now. Christian perfection is living in the heavenly will of our Father even while we are still upon this earth: it is a seeking to eliminate all pain and suffering and death of both humans and non-humans.